While I have a sweet tooth, there are plenty of desserts out there that are overly sweet. Adding a pinch of salt to a very sweet dessert can take that sugary edge off and make it even more delicious. Adding a pinch of salt to a dessert that is balanced and you can turn something already delicious into something that is downright addictive. 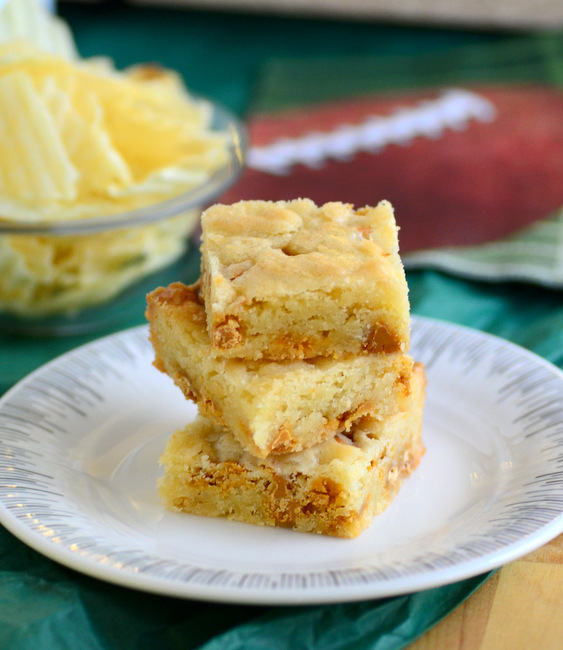 These Butterscotch Potato Chip Blondies are a wonderful blend of salty and sweet, chewy blondies loaded with crushed potato chips and butterscotch chips that are perfect for any snacking occasion. The recipe starts out with a straightforward blondie recipe. Like brownies, you want blondies to be dense and chewy, even though there is no chocolate in the batter. To keep that dense texture, these bar cookies do not contain any leavening agents – so don’t be surprised that baking powder and baking soda aren’t on the ingredient list! The blondies will rise slightly thanks to the egg in the batter, but they’ll be dense and chewy, with a crisp exterior after baking. The blondie batter is also packed with crushed potato chips and butterscotch chips. I used Lays Ruffles for the potato chips and I would recommend using something similar – crisp and salty, thin but not overly thin. Chips that are too thin will almost melt into the batter, while chips that are overly thick – like some kettle-cooked artisan-style chips – are so thick that they deliver almost too much potato flavor and start to take away from the blondie. The chips should be crushed down so that you have about 1 cup of chip bits, so you’ll need to start with about 1 1/2 – 2 cups of large potato chips. Once baked, the blondies are rich, buttery and have a nice burst of vanilla that works well with the mix-ins. You get the salt from the potato chips and a hint of crunch from some of the bigger pieces. The butterscotch chips adds a great sweetness, but their sweetness is really tempered by the salt of the potato chips. These are balanced and oh-so-easy to eat. These make a great after school snack or game day treat! Preheat oven to 350F. Lightly grease an 8-inch square baking pan or line one with parchment paper. In a large bowl, stir together butter, sugar, salt, egg and vanilla extract until smooth. Stir in the flour until completely incorporated. Fold in crushed potato chips and butterscotch chips until well-distributed. Pour batter into prepared pan and smooth into an even layer. Bake for 30-35 minutes, or until blondies are set and outside edges are lightly browned. Allow blondies to cool completely before slicing.